See the various opportunities we have for volunteers. If you've already registered as a volunteer, click this button to see this month's volunteer opportunities at the Volunteer Hub. Volunteering at Cotuit Center for the Arts is fun! And it’s essential. We simply can’t do what we do without our volunteers. 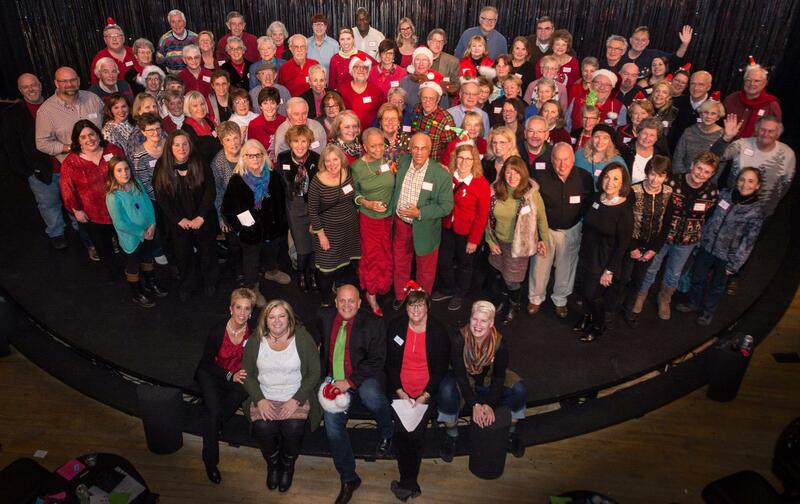 You’ll be joining a terrific group of friendly, dedicated, and fascinating people who enable our success with productions, classes, exhibits, performances, facilities, and special events. As volunteers, we have served in a variety of roles: usher, greeter, bar back, docent. Each time we learn a new role, we see a different aspect of what makes the CCftA so unique. We have the opportunity, not only to see how an event or production comes together, but to attend as well. We love volunteering, and we love being members, too. Come, join us! When you give of yourself, the payback is enormous. When you volunteer your talents and experience, you'll gain self-esteem and personal satisfaction from being part of something dynamic and important. You’ll meet like-minded new friends, participate in a spectrum of “cultural” activities, and come away knowing YOU have made a difference in the lives of others. You may even learn some new skills. Plus: you’ll have fun! Volunteering at the Cotuit Center for the Arts has opened a whole new world to me. Not only have I been able to meet talented people, but I have tapped into my own creative processes. Our Cape community needs a place like this to offer young and old intellectual stimulation. I wanted to be part of that growth. I enjoy my time at the Center be it as a greeter, helping with mailings, usher or bar back. And as a bonus, I get to see the productions and have enjoyed each and everyone. Being a "Cape Codder" another fun thing about volunteering is that I get to see many people I have known over the years and have met many new acquaintances. Being part of the volunteer staff and a member at the Center has been exciting to see it grow and the quality of the performances are second to none. I hope to be there for many more years. 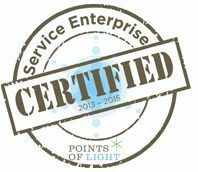 We are now a Points of Light Service Enterprise! Cotuit Center for the Arts is pleased to announce that we have been certified by Points of Light as a Service Enterprise! A Service Enterprise is an organization that fundamentally leverages volunteers and their skills throughout their organization to successfully deliver on its social mission. Cotuit Center for the Arts completed an extensive assessment, over 20 hours of training and consulting and extensive internal planning and change to better integrate volunteers in our day to day operations. By achieving this level of excellence and certification, Cotuit Center for the Arts is now better equipped to leverage the time and talent of volunteers and better meet our mission. For more information regarding volunteer opportunities with our organization, please visit our Volunteer Opportunities page. For further information regarding the Service Enterprise Initiative, please visit Points of Light website.